Tue., Jan. 29, 2019, 5 a.m. The big game is just around the corner, and I know feeding a crowd of football fanatics can be a sport on its own. So I’m here passing a touchdown of a recipe to you. Like so good, you’ll be MVP status. Ever heard of monkey bread? It’s a sweet, buttery, pull-apart loaf that gets its name from the little individual pastries being picked apart and eaten with your fingers, as a monkey would do. Now, let’s put a savory twist on that with everyone’s favorite food: pizza. Pizza’s always a winner, no matter what shape or form it comes in – especially a Bundt pan. 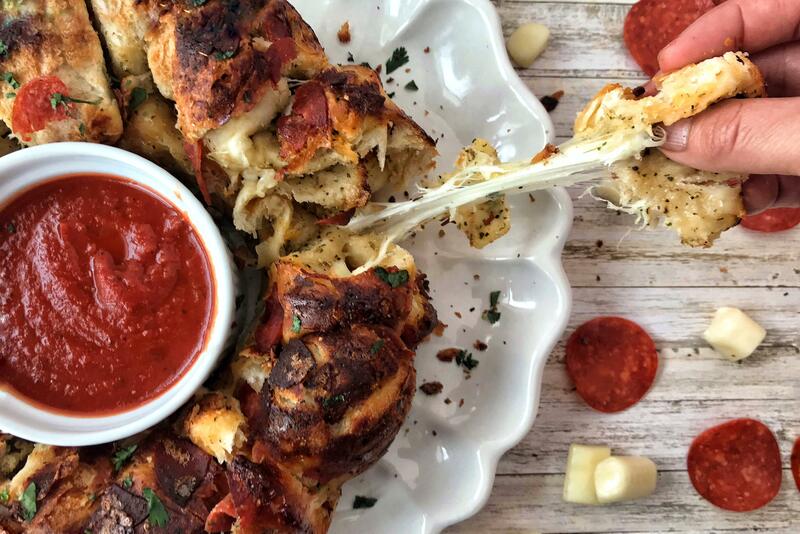 This pizza monkey bread takes chunks of dough filled with pepperoni and mozzarella, and tosses them in a garlicky butter and cheese mixture. It’s poured into a greased Bundt pan and baked to gooey, golden perfection. I serve it with a warm bowl of marinara for dipping – which fits like a glove in the middle of the monkey bread. And, yes, you ranch-dipping fanatics, that can be used, too. And, like the toppings on a pizza, the options for fillings are endless: Hawaiian-style, meat lover’s, veggie – or even anchovy and onion. It’s a dish that can be made to suit anyone’s taste. Also, if you don’t have a Bundt pan, a 9-by-13-inch baking dish would work fine. Just lower your baking time and keep an eye on it. Heat oven to 375 degrees. Coat Bundt pan well with nonstick cooking spray. Cut 10 pepperoni into quarters and place in a large bowl, along with the melted butter, seasonings, shredded mozzarella and Parmesan. Stir and set aside. Remove dough from both cans, do not unroll. Cut each roll in half, lengthwise, then cut each dough length into 10 pieces, for a total of 40 pieces. Flatten each piece into a disc and top with a slice of pepperoni and a cube of mozzarella. Wrap the dough around the pepperoni and cheese, pinching well to seal. Place dough balls in bowl of seasoned butter-cheese mixture and toss to coat. Pour into the prepared Bundt pan. Bake at 375 for 30-35 minutes, or until golden brown. Slide a knife between edge of pan and bread to loosen and invert bread onto a platter. Sprinkle with fresh chopped parsley and serve with warmed marinara for dipping. Published: Jan. 29, 2019, 5 a.m.